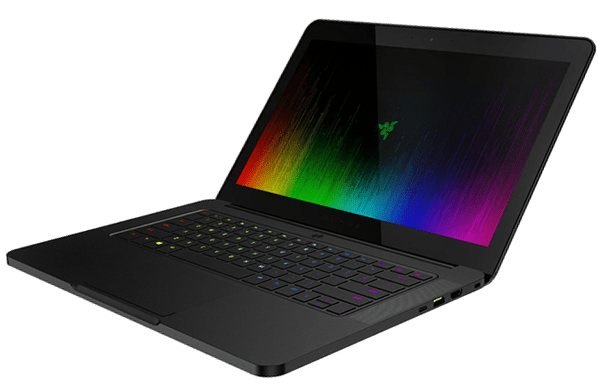 We all know by now that Razer Blade products are pretty dope. 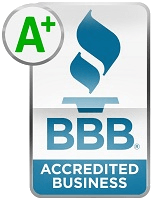 With each and every change and tweak, they provide some type of different experience. This 2016 model Razer Blade Pro with a GTX 1080 is no exception to the rule. Let’s take a look at the engineering marvel that can stuff this packaging into something this small. 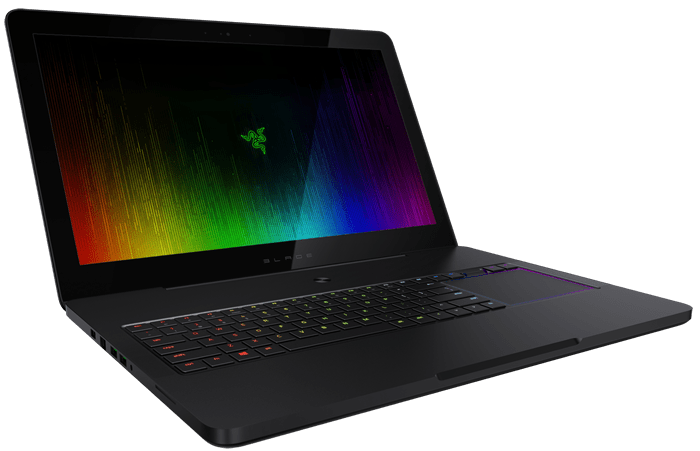 It tips the scales at a killer 7.8-pounds, but it still only sits closed at 0.88-inches thick and has a 17-inch screen. Crazy, right? 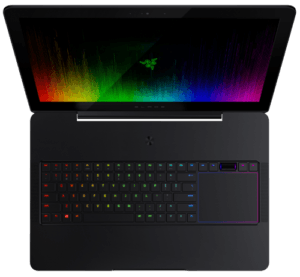 It is aluminum all around, but it feels like a step up from the Razer Blade Stealth, and the regular 14-inches. Maybe because it’s thicker it feels sturdier. It still has the same black anodized finish, so if you want to protect this unit you’ll need a sleeve or carrying case. The port selection is OK for a 17-inch laptop. it has Ethernet and three USB 3.0 ports, full-size HDMI and an SD card reader, and it also has a Thunderbolt 3 port. Too bad there is only one Thunderbolt 3 port because on a device like this one you want it to run as long as possible and USB-C ports are the future. 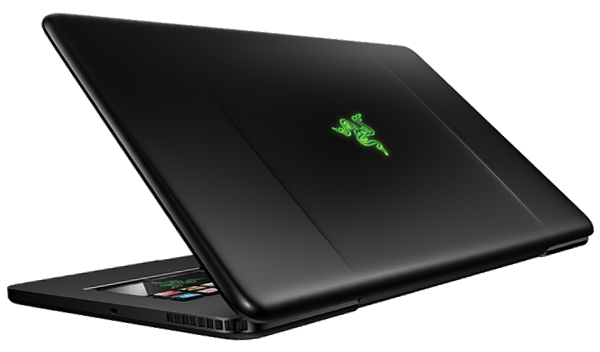 This Razer Blade Pro uses a 17-inch IGZO touchscreen. With sRGB at 100% and Adobe RGB at 99%, it has incredible color accuracy. It’s bright oo with 350 nits, and with the 4K you’re getting 3840 x 2160p panel. Visually, this has to be one of the best laptop screens we’ve seen for a creative content machine. It’s nice and big at 17-inches and it supports G-Sync at 60fps, so games look awesome on this device. The keyboard is a mechanical keyboard and it’s very tactile, but it is not as enjoyable to use as a regular mechanical keyboard. It has good travel, but the responsiveness of the keys aren’t as snappy as you might expect. 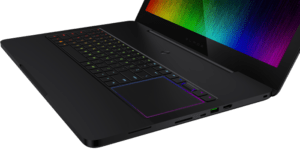 We still like it a lot, especially with the individually lit keys, but I wouldn’t call it the universally best laptop keyboard. There is one issue with the layout when you try and type a “?”, why may hit shift + up arrow because of its position. Other than that, it’s OK. The trackpad is good, it uses Windows Precision drivers, so that’s a win. It has great texture and button mechanics. Having it located on the right side of the keyboard is a little strange at first, but it’s something I think you can get used to fairly quickly. there are media keys and a programmable scroll wheel that you can set to control other features like volume and what-have-you. 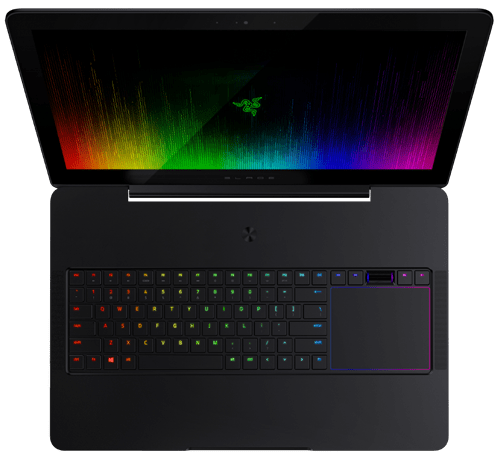 As usual you can customize all of this stuff through the software; the lighting, the key mapping, and the scroll wheel functions are all controlled through the Razer Synapse. RGB lighting is cool, and Razer does it the best, but the novelty of it wears off pretty quickly, so don’t purchase this just for that. Speaking of buying this device, it retails for $3,700 USD with the base model specs. 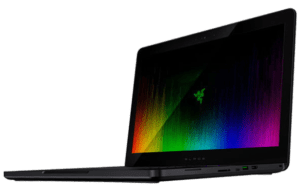 That’s expensive, it’s expensive for a laptop, and it’s even expensive for a laptop from Razer. With this price tag comes some really good components on the inside. The RAM is soldered on, it’s running 32GB. There are two SSDs that are upgradable and they come set up as RAID-0 out of the factory. It has a 2TB SSD RAID-0 that writes at 2850MB/s and reads at 2850MB/s (1TB SSD x 2 read/write speeds of 2800MB/s and 1500MB/s respectively). It’s really super fast, it’s faster than the MacBook Pro form 2016. Granted it is RAID-0, but even if you run the two drives individually without RAID-0, they are still really fast. It has a 99 watt-hour battery, which is the legal limit in order to carry onto a plane, and with this battery you can expect around 3-4 hours with regular usage with the screen set at about 60% brightness. It’s decent for a 17-inch laptop, certainly not amazing. You have to keep in mind that it is running a G-Sync panel so there’s no NVIDIA Optimus for power savings. The GPU is a GTX 1080. This graphics chip fitted into a system this thin is why the price tag is so high. It is incredibly expensive and difficult to do it properly. 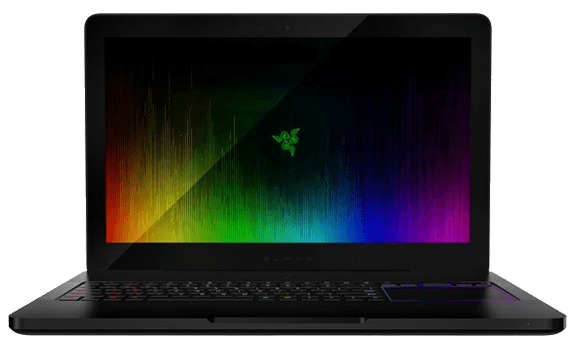 This is why Razer is the only company to have a GTX 1080 in a laptop this thin (as fo 2016). Performance is obviously really good. 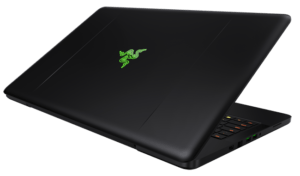 In terms of video editing, the GTX 1080 is faster than any other laptop GPU we’ve used. However, Adobe Premier has its limitations with GPU acceleration, we’re not getting massive performance gains over something with a GTX 1060 or even something like the 960M. At least with GH4 footage. If you are working with raw footage the difference is noticeable. Using 5K raw footage from the Scarlet W, the GTX 1080 starts to show its bigger gains. Where the GPU really begins to flex its muscle is in games. Something relatively light like Overwatch will break 100fps on ultra settings while playing 4K. Playing something heavier like Doom, on ultra settings and 4K will still yield about 65fps, fire up the G-Sync feature and you will have this thing running some of the smoothest and highest resolution games you’ve ever seen. For really demanding triple-A titles, playing at 4K is possible, but you just won’t have the best frame rates. Just switch to 1080p and you’re good-to-go. The hardware in this machine is very powerful and will easily power VR. It has three fans, two of them to cool vapor chambers and then one of them to circulate internally. On this model it is really quiet, it’s nearly silent. When you do more CPU demanding stuff like Adobe Premier, fan noise is louder yet tolerable. Under a heavy gaming load and it’s running full power it can get pretty loud. Also, as soon as you take the heavy off, the fans immediately ramp down and conserve power. Internally and externally this machine stays well within the acceptable temperature ranges. The speakers are noticeably better than the 14-inch Razer Blade laptops. They are definitely louder and the bass is cleaner since they are side-firing speakers. For gaming though, in order to hear things really clearly, you’ll need headphones because the fans will drown out the game. The AC adapter is 250-watts and it’s pretty slim. It will fit nicely into a carrying case or slim bag. Though since it weighs over 7-pounds this will more than likely be a desktop residing machine.